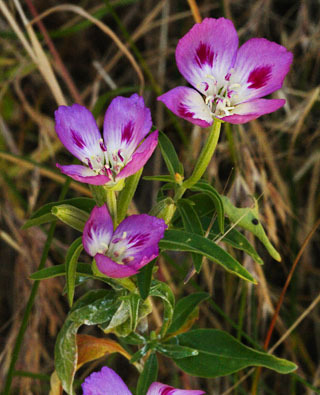 4 petals in a bowl shape, variably pink or purplish, vertically streaky, often with a carmine splotch near base, or partly white, ⅜–1½ long [1–4 cm]; calyx bent off to one side, shallowly 4-lobed; 8 stamens; pistil resembles a tiny yellow or white 4-petaled flower; leaves alternate, linear, 1–3″ long [25–70 mm]; plant annual, several-flowered, 4–32″ tall [10–80 cm], can be slender or widely branching. Habitat: Grassy clearings or open forest; lowland coastal WA, OR, s VI. Natural History: Countless flowery meadows or “hanging gardens” interrupt the cliff slopes of the forested part of the Gorge. They typically bloom in spring and are quite dry by midsummer. As its name suggests, farewell-to-spring blooms around May or June, when the wildflower display is winding down.